Motorola yesterday unveiled their much hyped Droid phone which will be the first phone to be powered by Android 2.0 platform and is set to release on November 6th on Verizon Wireless. The timing of Droid phone release is interesting as it collides with the first multitouch-capable Windows phone (HD2) by HTC which is also set to release next month and will be powered by Windows Mobile 6.5 with HTC Sense running on top it. The following comparison may help you decide which phone to get between these two, come this fall. Supports up to 32 GB microSD. 3.7-inch (diagonal) capacitive widescreen touch display with 854 x 480 pixels. 4.3-inch capacitive widescreen multitouch display with 800 x 480 pixels. 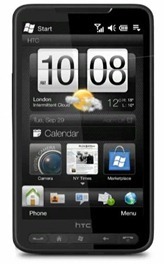 On paper, HTC HD2 surely has more firepower (thanks to its 1Ghz Snapdragon processor), multitouch support and larger screen than Droid. Droid on the other hand has an edge due to Android which is faster, more stable and consistent than the rather anemic Windows Mobile OS. For the end-user in the end, it may actually comes down to the preferred choice of platform, and whether or not they will prefer the slide-out QWERTY keyboard on Droid over the onscreen one with support for multitouch on HD2. The Motorola droid is a multi-touch device. How Java applications on Droid ar faster than native applications on WM? The HD2 doesn't have 16GB or 32GB flash drive. 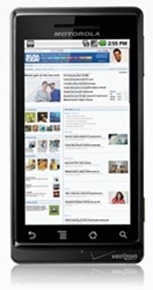 Motorola Milestonte GSM has multi-touch for the Browser, at least the Brazilian version. Upgraded from iPhone. I really love this phone. Windows? No, thanks! I take a UNIX based system over MS any day. Whatever extra power you pack in the processor gets lost in a poorly designed and wasteful OS. I am commenting because I've tried both devices as well and I reached the exact opposite conclusion – the Droid is way superior! Now if the HD2 would run Android 2.0, then it would beat both the MotoDroid and the IPhone (I mention the IPhone because I think it has a better form-factor than the Droid) hands down. Poor choice of OS is why the HD2 will not win this battle. what shall seperate me from the love of my droid? shall famine or sword or danger or heigth or depth or power or death? no i am convinced that all things things cannot sepreate me from my droid…but VERIZION as a company has done this, with there ridiculous fees and such. i was forced to switch to t-mobile and settle with the htc, which is not all that bad. i truly feel sorry droid having to be owned by verizion…..it deserves better. Just to let you know, you really need to take a peak an project android. Android 2.1 on a WM phone such as the HD2. I have the Touch Pro2 and Have android 2.1 dual booting with win mobile 6.5 pro. Not all functions work, but they are well on their way.